Wearing a tiny, pink ribbon is a familiar sight during the month of October. From your next-door neighbor to an entire NFL team, the bond formed by Breast Cancer Awareness Month is unmatched by anything else. Those tiny, pink ribbons have brought breast cancer awareness to light for so many. Now the question is: how many people know the reason behind the pink ribbon? What must be done next to educate ourselves? To find out, we decided to poll our office. Of the surveyed group, about 50% stated they know the benefits of early detection and what that entails. While this is awesome news, it is interesting to note that the other 50% stated that they are uncertain, or simply have no idea about where to start with early detection. Roughly 1 in 8 women will be diagnosed with breast cancer in their lifetime. Almost 70% of our surveyed group stated that they know someone very close to them (such as a friend or family member) that has been diagnosed with breast cancer. The Center for Disease Control and Prevention reports that 1 in 8 women will be diagnosed with breast cancer in their lifetime. THAT is a crazy number to think about. With the exception of skin cancer, breast cancer is the most common cancer among American women and a leading cause of death. There is a silver living to all of this. According to the American Cancer Society, only about 3% (1 in 36) of women will die from breast cancer, as death rates have continued a steady decline since 1989. They go on to say that earlier screening and detection and the monumental growth in awareness have contributed to this. Between 70 - 80% of patients diagnosed with breast cancer had no risk factors or family history of the disease, according to the National Breast Cancer Foundation, Inc. Regular mammogram screening is recommended once a woman reaches their 40's, but earlier if you have a family history of breast cancer or multiple risk factors. 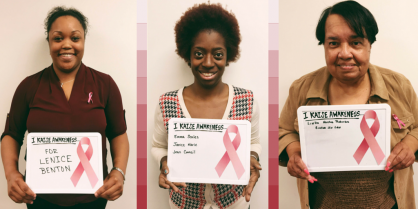 MediCopy employees, Lenice, Jameia & Beverly, showing their support and their pledges to raise breast cancer awareness for those they love. There are many ways to fight back against breast cancer. We are closer than we've ever been to making this disease a thing of the past. While early detection is still key, doctors have also found that exercise and breastfeeding aid in lowering the risk of breast cancer, while alcohol, poor diet and a sedentary lifestyle can raise the risk (National Breast Cancer Foundation). Showing support is amazing. The more people that are educated about early detection and breast cancer, the better chance we have of conquering this disease. Even if breast cancer does not affect you directly, chances are it will indirectly affect you at some point in your lifetime. Get screened. Encourage all your family and friends to get screened. Together we can stick it to breast cancer once and for all.